In Poland, it’s only a few hours until the end of the year, so it’s an excellent chance to make a summary of things that happened to C++! As you might guess the whole year was dominated by the finalization and publication of C++17. Yet, there are some other “big” things that happened. Let’s see the full report. Previous reports: 2016, 2015, 2014, 2013, 2012. As usual, at the end of the year, I try to gather essential events that happened in the C++ world. If you want to see predictions/expectations for 2018, read this post from Meeting C++ C++ in 2018. Before we dive into the newest stuff, let’s recall what’s the status of C++11 and C++14 implementation. Just for the reference Clang (since 3.4 ), GCC (since 5.0) and Intel (version 15.0) already have full support for C++11/14. Visual Studio with frequent releases of 2017 (Compiler version 15.5 and 15.6 currently) made significant progress towards implementing the missing parts: Expression SFINAE and Two-phase name lookup. It’s not fully conformant, but very close to reach it. Read more in the VS section below. The new standard was the main topic for the year. In December it was published as ISO/IEC 14882:2017 Programming languages – C++. The standard was technically completed in March so at the beginning of the year we knew its full form. You can also download a free version of the last draft: N4659, 2017-03-21, PDF. 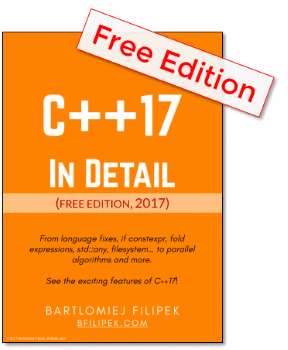 C++17 In Detail - 50-page PDF with description of all the features. And, as it appears, it’s relatively easy to jump start into C++17, as most of the major compiler vendors implemented (or are very close) support for the new standard. The original table has confusing/wrong versions for Visual Studio, thanks to a comment from Stephan T. Lavavej I've corrected it using data from the recent VS compiler notes. As you see most of the bigger features are there! The problematic parts: parallel STL and filesystem are close to being available. TS - for filesystem means that you have to use std::experimental namespace. N/A for Intel - Intel does not ship with library implementation. Visual Studio 2017.5 started to ship a few of parallel algorithms. Visual Studio Versioning (from comment by Stephan T. Lavavej): The mapping is: 2015 (and all updates) was compiler 19.0, 2017 RTM was 19.10, 2017 15.3 was 19.11, 2017 15.5 is 19.12, and 2017 15.6 will be 19.13. Unfortunately, there won’t be C++18 (as I hoped in my April’s post :)). However, the committee has a stable progress towards C++20. Some features are already voted into the C++20 draft. So that’s the “master plan” and a guideline towards the new standard. Of course, it doesn’t mean other things like Coroutines (in fact Coroutines were recently published as TS), contracts or your favourite future feature won’t be approved. The teams behind popular compilers make massive effort to stay up to date with the standard. In most of the newest versions (like GCC, Clang, VS) you can use most (or all) of C++17… but also a few C++20 features. For example, you can try concepts-lite in GCC; modules support in Clang or MSVC, or Coroutines. Not to mention Ranges. From this point, it looks that C++20 will be a bit bigger than C++17. Still, it’s important to remember that the Committee prepares a new standard every three years. So don’t expect that they’ll wait for the publication until all features are done (like we needed to wait 10+ years for C++11). There were three committee meetings this year - in Kona, Toronto and Albuquerque. Roughly at the beginning of the year, the committee closed work for C++17 and at the second and the third meeting they started voting features for C++20. During the meeting, C++17 was finalized and sent for the final ISO review. The committee now shifts to prepare C++20; you can even read some plans here Feb 2017 - P0592R0 - “To boldly suggest an overall plan for C++20”. The first meeting where Committee experts could vote changes into Draft C++20! String Prefix and Suffix Checking - P0457R2 - starts_with and ends_with for strings and string views! Current versions and most notable updates. Current version VS 2017 update 5 - 15.5.2 - Release notes - December 2017. Only 3 were significant toolset updates, though (15.0, 15.3, 15.5; the other releases contained IDE updates and the occasional compiler bugfix). As you can see in the image above MSVC created a pool of threads, and each thread invoked my lambda. In V15.5 the following algorithms can be invoked in parallel: all_of, any_of, for_each, for_each_n, none_of, reduce, replace, replace_if, sort. Here are some links to relevant blog posts from VC team. I like the transparency and that they share so much information with us. If you wonder why LLVM moved “slowly” with versions like 3.3, 3.4, 3.5… and now rapidly went from 4.0 to 5.0 here’s the reason: the versioning scheme changed. Previously major version increased by adding “0.1”, now it’s done by adding “1.0”. C++ coroutines TS implementation was added in 5.0.0. This is a brand new section in the summary. While compilers do the primary job with our C++ code, we cannot forget about the importance of other tools. Bear in mind that parsing C++ code is a tough task. Thanks to Clang developing tools is now significantly improved and streamlined. For Visual Studio: Clang Power Tools - Visual Studio Marketplace - image above. Visual Assist - it now offers Code Inspections based on LLVM/Clang. CppDepend v2017.3 - see all of the changes here - for the whole year. We probably won’t see a standard package manager for C++ (as other languages sometimes provide), but there’s good progress with such tools. Read this article/discussion for more information: Does C++ need a universal package manager? - by (Paul Fultz II). Anyway recently I started using Conan, and it really works. Previously I had to download the components, install it, set proper links and paths in Visual Studio project. Now all I have to do is to provide an appropriate name of the library in conanfile.txt and run Conan to do all the work. The missing part: not huge list of available packages… but it’s improving. Conan - very active development in 2017, now in v1.0 beta! Sourcetrail (image above). Its objective is to assist with code exploration by creating dynamic graphs that show your project from a different perspective. See my review in this post - Better code understanding with Sourcetrail. The tool is free for non-commercial use! But there are more: like Code::Dive, Italian CppCon or Pacific C++ - held for the first time this year! Just in case here’s the link to ISO C++ page with all registered conferences around the world: Conferences Worldwide, C++ FAQ. Near the same time Bjarne Stroustrup was awarded 2017 Faraday Medal. Congratulations! This year Bjarne Stroustrup gave the opening keynote (“What C++ is and what it will become”). The closing keynote was presented by Louis Dionne (“C++ metaprogramming: evolution and future directions”). Mostly about C++ plus other languages like Rust, Go, Python. Another strong point of the year: the community is growing! There are so many local C++ groups, slack channel, conferences, blogs, youtube channels… and we even have a podcast: CppCast. Maybe it’s my personal feeling - I usually track the changes and try to be active in the community - so I feel that growth and vibrancy. Still, I hope other developers can share the same opinion. Thanks to Jens Weller for giving advice how to start such community, motivation to run them and hosting groups news at Meeting C++ site. See User Groups Worldwide or a news like C++ User Group Meetings in November 2017. And congratulations for his 5th year of Meeting C++! September 18 C++ Templates: The Complete Guide (2nd Edition) 2nd Edition David Vandevoorde, Nicolai M. Josuttis, and Douglas Gregor. I am still waiting for Large-Scale C++ Volume I, John Lakos, it finally should be ready in April 2018! At code::dive John Lakos mentioned that the draft is completed. So hopefully this date won’t be shifted. Wow, so many things happened! As I mentioned, in the beginning, the finalization of C++17 set the whole “theme” for the whole year. I like that the 3-year standardization process works and we can expect C++20 without delays. What’s more, the compiler vendors have already implemented most of the C++17 features, so it’s easy to apply new techniques to your projects. I also feel that “we’re all” creating the new language not just “they”. There are many groups or even r/cpp discussions where you can express your thoughts about the new things in the standard. I like such transparency. There are of course downsides of frequent releases. A lot of C++ code is sometimes even not in C++11 version. A lot of us struggle with the maintenance of legacy code and learning modern standard is not an easy task. During the year I’ve heard an opinion that “real C++” (that we use in most of our projects) is so different than C++ presented in the newest standard. The gap is getting bigger, and bigger and developers might be frustrated (I expressed more thoughts on that topic in my post: How To Stay Sane with Modern C++). What do you think about C++ in 2017? What was the most important event/news for you? Did I miss something? Let me know in comments!